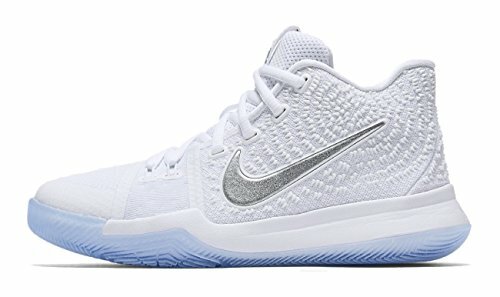 BUILT FOR SHARP CUTS The Kyrie 3 Big Kids' Basketball Shoe helps you move quickly in any direction thanks to a uniquely rounded outsole. BUILT FOR SPEED Kyrie doesn't stop and start-he's always in motion. A rounded outsole with two independent traction pods allows fast, fluid play. FLEXIBLE SUPPORT Across the top of the shoe, a strong, stretchy band flexes with your foot for support during quick cuts and sprints. LOW-PROFILE CUSHIONING Full-length foam cushioning provides lightweight comfort and a great feel for the court.